Sean Lee is out for an extended period with an injury, a movie the Dallas Cowboys’ faithful have seen on repeat for what surely feels like forever. A new movie, Cowboys fans can find comfort in, however, is the emergence of first-round rookie linebacker Leighton Vander Esch. Brought in as the 19th overall selection in the 2018 NFL Draft, Vander Esch was expected to play a complementary role behind Lee and second-year Notre Dame product Jaylon Smith in Year 1 of his NFL career. Lee’s injuries have instead pushed Vander Esch into the limelight in his rookie campaign, as he’s accrued a whopping 336 defensive snaps to start the season. And early returns really couldn’t be better. 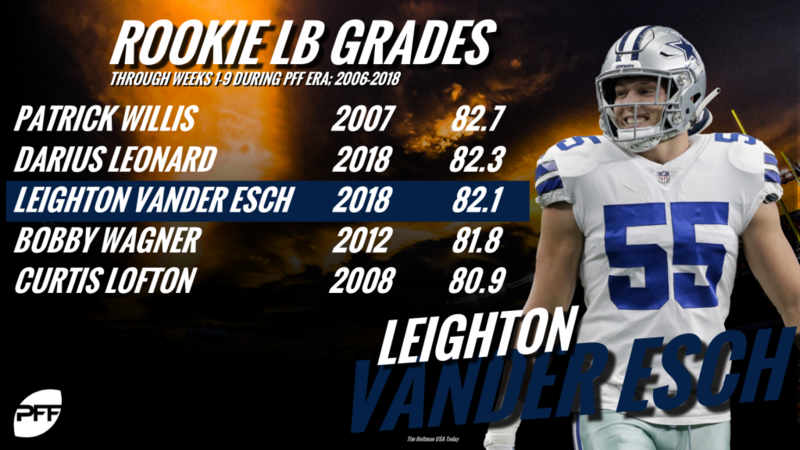 Vander Esch has earned an 82.1 overall grade across his 336 defensive snaps, which ranks third among all rookie linebackers with at least 300 defensive snaps in Weeks 1-9 in the PFF era (2006-Present). Only 2018 second-round pick Darius Leonard (82.3) and the 2007 version of the great Patrick Willis (82.7) rank ahead of Vander Esch, and 2012’s Bobby Wagner (81.8) and Curtis Lofton’s 2008 rookie campaign (80.9) sit just behind him on the list. The 6-foot-4, 256-pound Vander Esch looks the part if comparing him to the NFL’s traditional, run-stopping linebackers like former Chicago Bears off-ball linebacker Brian Urlacher (6-foot-4, 258 pounds). However, LVE’s run defense hasn’t been the bread & butter like his menacing frame would suggest; it’s been his coverage ability that has stood out. Among the 48 NFL linebackers with 300-plus defensive snaps in Weeks 1-9 of their respective rookie campaigns, Vander Esch ranks third in coverage grade at 82.7. He also ranks fifth in first downs allowed per target (0.23) and 11th in yards allowed per target (5.87) among that same group of rookie linebackers. That doesn’t mean Vander Esch has been a slouch against the run, however. His run-stop percentage (11.5%) and run-defense grade (74.4) rank seventh and 12th among rookie linebackers with 100-plus defensive snaps in Weeks 1-9 in the PFF era. Vander Esch’s ability to always be around the football is also second to none, as he leads all qualifying rookie linebackers in the PFF era in percentage of defensive snaps he’s been the first defender to contact the ball carrier at 14.98%. That figure speaks to his speed, athleticism and range as an off-ball linebacker, three attributes that have all proven vital to successful linebackers in today’s NFL. Lee, who is expected to nurse his hamstring injury for the next four to six weeks, hasn’t come close to the successes of Vander Esch even when healthy this season. The 32-year-old, nine-year veteran linebacker has earned just a 64.9 overall grade across his 193 defensive snaps this season, ranking tied for 36th among the 82 off-ball linebackers with 150-plus defensive snaps this season. He’s also earned a sub-60.0 coverage grade across his 100 coverage snaps on the year. If Lee doesn’t return from injury, he’ll finish the season with the lowest overall grade of his career, which, combined with his injury history, is a sign that his NFL career may be coming to a close. He hasn’t played over 700 defensive snaps in a season since 2016, and all signs are pointing to further health concerns and declining play from the wily veteran. Lee’s falling out isn’t an easy pill to swallow for anyone that has followed his career, as he’s earned 89.0-plus overall grades in three of his nine seasons in the league and has been a staple leader and difference-maker for the Cowboys when healthy. Father Time is undefeated, however, and he’s creeping in on Lee, making it that much more apparent that a changing of the guard could be on the horizon. Fortunately for the Cowboys, Lee’s replacement, Vander Esch, has proven he’s ready to take the torch from Lee and deliver high-end production in his place.